If we go back a decade, Bluetooth earbuds would have been the worst and most cumbersome way of listening to music as the technology was still in the developing phase and the transmission was not as strong as it is today. However, the Bluetooth technology is way more sophisticated which is why Bluetooth earbuds have been receiving immense fame. Innovation in the battery charging, size etc. along with the wireless transmission standards has caused a huge breakthrough in the industry. They are not only less complicated but also are less fussy. Which is the main reason 90 percent of the people invest in these earbuds. The best part is that they are developing rapidly as time passes by and their prices are decreasing, pairing is as simple as plugging in wired headphones. They have an ideal battery life and can go on for hours. They can easily hit the 12 hours mark on one charge which makes them perfect for traveling. The debate “wireless is better than wired due to the technology” is not yet valid. However, if we look at the gap between the development and sophistication, the gap is very narrow. Anytime now, wireless technology can take over. Hence, investing in a good pair of Bluetooth earbuds will only make your life easier. From driving a car to riding a bike everything becomes easier and less fussy. You can even use them while swimming, how cool is that? These high-end headphones by Jabra will be your best companion as it provides the best quality sound whether it is during calls or while listening to music. It comes with its own charging case that increases its battery life by an extra 10 hours. The sound quality and clarity are the best parts of these earbuds. They have been checked and tested again and again for proper connectivity and sound clarity. Moreover, they are completely water, dust and sweat proof which makes them perfect for use during workout and swimming. The company also offers 2 years waterproofing and dust proofing warranty. The earbuds include four microphones which not only lets you speak clearly but also reduces the effect of wind and other noise while you are talking. It connects to the Jabra sound app on your phone and you can customize your sound quality by customizing the equalizer and bass using the application. 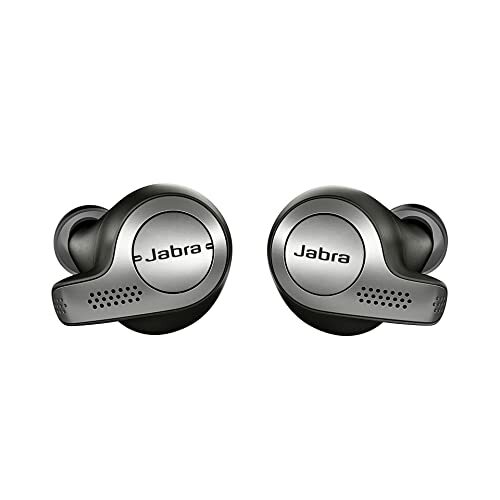 Jabra has been in the business for a long time and these earbuds are a third-generation wireless product, hence, the technology use is very much sophisticated and gives you a truly wireless experience without causing any connectivity problems. They provide up to 5 hours of charging which you can convert to 15 hours with the charging case. They include an IP55 rating against resistance for water, sweat, and dust. This not only makes them durable but also proves that the sound quality will not deteriorate over time. It comes with a two years warranty against dust and water resistance. You can customize the sound quality that you receive. The connectivity is very stable and reliable. It is water, sweat and dust proof. The auto-switching ability of these earbuds is not up to the mark. These reasonable yet high-quality headphones by GT ROAD might be your new favorite if you want something for your workout routine. With a play time of more than 8 hours, it comes with auto connectivity and noise cancellation. Since it is specifically for athletes and sports persons it is very convenient and easy to use. As soon as you open the charging case, the headphones connect to your phone if the Bluetooth is on, so you don’t have to reconnect every time you need to use the headphones. Moreover, to disconnect the earphones and turn them into charging mode, all you need to do is put them back in the case. It uses Bluetooth 5.0 which has the best connectivity and even provides an amazing bass and beat. The stereophone calls and undisturbed connectivity takes these headphones to another level. The Bluetooth chipset in these headphones provides HD quality sound and also has the ability to convent the earbuds to single mode. This means that you can use each headphone as a single unit. Most of the Bluetooth earphones lack good sound quality during phone calls but these earbuds by GT road provide crystal clear quality on phone calls. It comes with 45 days money back guarantee. This can be considered as a trial period. You can choose to return the product and get all your investment back. Apart from this, it also comes with a 12 months warranty in case of any technical problems. It has 45 days money back guarantee and 12 months warranty for technical faults. The device provides a high definition sound quality. It has multi-using mode enabled. Latest technology of Bluetooth is used. It has an auto connectivity feature. It does not include varying size ear pieces. 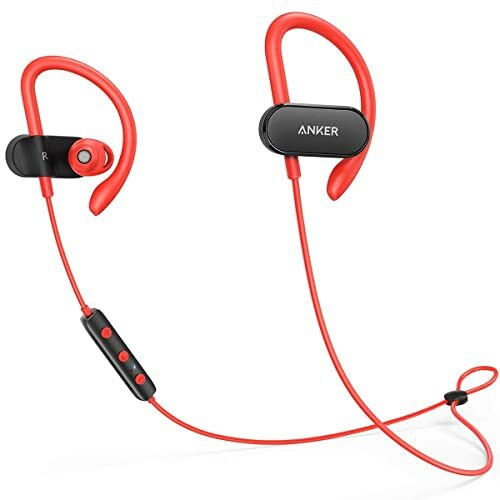 These lightweight headphones by Anker give you the ideal and most feasible features for such a reasonable price. With 4.1 Bluetooth technology, they provide a steady connection and perfect sound quality. The drivers used are 6mm which makes them stable, durable, tolerable and sturdy. This means they will not deteriorate with time. It has an IPX5 shell which is known for its water resistance and durability. For double protection, the inside of the shell is covered with Nano coating, which makes all the technology inside safe dust and water. Even if it is sprayed with jets of water, it will keep on working. These headphones are made to be lightweight, so they don’t feel like a burden while working out, driving or riding your bike. Since it is waterproof it is also sweat resistant and can be easily used during workout sessions. Many amateur bicyclers have rated these headphones as there favorite. On one charge, these headphones can give you more than hours of play time which makes it way better than many premium headphones that provide 5 or 6 hours of runtime at a much higher price. It comes with a set of earphone tips that can be changed or customized according to the size of your ear. Hence, these headphones are compatible with all ear types. It comes with its own data cable for charging and ear tips with sizes extra small, small, large and extra-large. Last but not least, it comes with 18 months warranty for any technical defaults. It has a set of four different sizes of ear tips in the kit. The device includes an 18 months warranty. It provides a run time of 7 hours on one charge. The product is available at a very reasonable price. Its features are comparable to features of premium Bluetooth headphones. These headphones do not connect to two devices simultaneously. 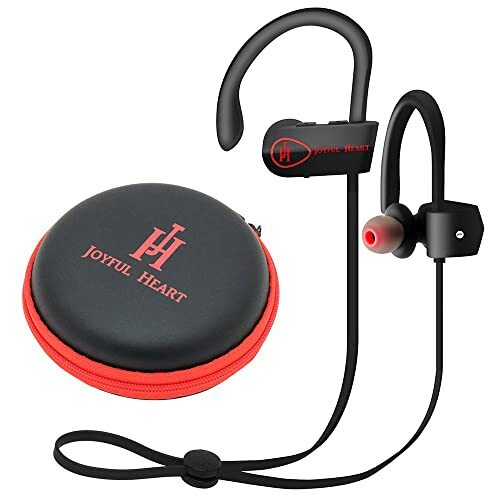 These Bluetooth headphones by heart are another set of highly rated earbuds for a workout. With their dandy red and black combination, they feature 8 hours of battery life and high-end noise cancellation at such a low price. They are built to give the best performance during heavy workouts. The earpieces have clips on them to fixate them on the ears. This way they don’t fall off while running, brisk walking or heavy lifting. Moreover, during phone calls, they reduce the noise to a minimum and transmit a high-quality sound to the person on the other side. Even though it is specifically for the workout, riders can use it on their long rides as it has all the required features. 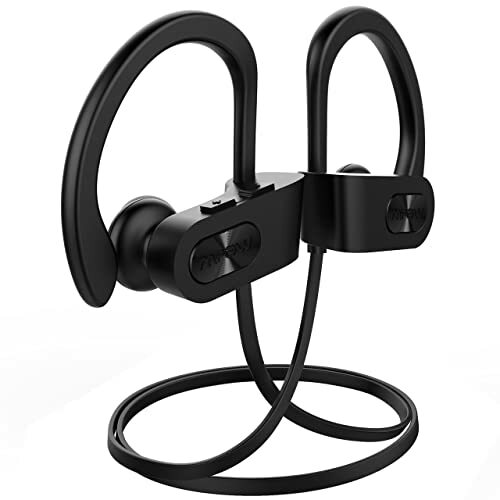 These Bluetooth headphones use Bluetooth 4.1 technology which is a reliable and stable technology even though it is slightly old. They always provide a high-transmission level with the noise reduction mic installed in the earpieces. Moreover, it has simultaneous connectivity as well. Which means it can connect to two different devices at one time. The covering for the earpieces is an IPX7 which means it is completely water, sweat, and dustproof. So even during sweaty workouts or during workouts that require getting wet like swimming, you can use these headphones without any complications. This set of earbuds does not provide flat audio rather has bass, treble and beats across all ranges of audio. With a crisp sound, it provides clears highs and lows that make the complete experience even better. It provides uninterrupted 8 hours of play time and only takes a maximum of 2 hours to charge. It comes with a money back guarantee as soon as you purchase it. The device comes at a reasonable price. The battery takes less time to charge as compared to other Bluetooth headphones. The sound quality is pretty good and is not flat. The range is not a lot. When coming to the world of Bluetooth headphones, Anker cannot be left behind. It has the best, most reliable and reasonable headphones on the market. Their wireless sound buds are constructed keeping in mind sports enthusiasts that require heavy duty and long battery life wireless headphones with noise reduction and soundproofing. In the mid-range category, these headphones have been labeled as the best headphones for sportsmen whether they are swimmers, athletes, bikers or bodybuilders. 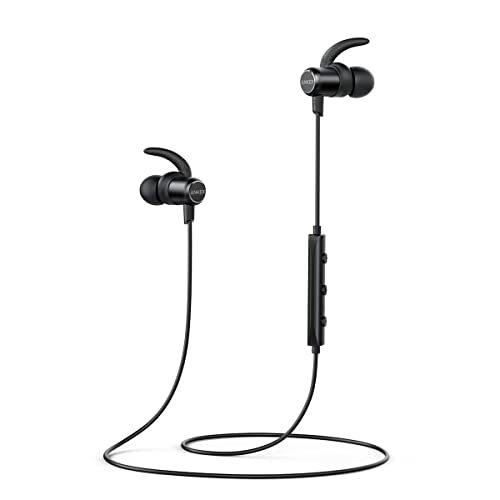 They use Bluetooth 4.1 technology with Qualcomm for superior sound quality and in-built mic with noise reduction technology it provides ideal features at such a reasonable price. At full power, these headphones give you as long as 12.5 hours of music time and the best part is that these headphones don’t even take long to charge. With a 10 minutes charge, you can get 1-hour long music time. It has double protection against water, sweat, and dust. Furthermore, it has a waterproof shell on the outside and Nano coating on the inside which makes it durable and sturdy. It comes with its own carrying pouch and different sizes of ear tips. These ear tips help you customize the headphones according to the size of your ear. There are two different types of ear tips included in the kit. One is memory foam and the other is silicon. Apart from this, the earpiece of these headphones is such that it fixates on your ear so that any rigorous movements do not cause it to fall out. It comes with 18 months warranty in case of any technical difficulty. It has 18 months warranty in case of technical faults. Battery time on one charge is as long as 12.5 hours. The casing and inside coating is waterproof. The earpieces fixate on the ears to prevent falling. Two different types of ear tips are added to the kit. It cannot simultaneously connect to two devices at one time. These wireless headphones by Mpow can be a swimmer’s best gadget due to their high-end IPX7 shell that not only makes it sweatproof but also makes it waterproof. You can easily use them during your swimming routine. It does not matter if you don’t have a waterproof phone. All you need to do is connect your headphones to the phone and put your phone away in your bag. The IPX coating also improves the life span of the headphones by making them more resistant to dust and other particles that may hinder the connectivity of the headphones to the device. These headphones come with easy connectivity with Bluetooth 4.1 technology. They don’t have a flat sound rather have a rich bass and treble even with the Bluetooth compression. This kind of crisp sound is not very easily achievable after Bluetooth compression. These headphones come with a snug fit so that they don’t come off during swimming. The comfort and convenience of the user is something that the manufacturers gave priority while constructing these earbuds. They are undoubtedly one of the most comfortable wireless earbuds on the market. It uses an improved version of the lithium battery, with only 1.5 hours of charging, it can give you a music time of as long as 9 hours. Moreover, it has an overvoltage power cut off that prevents the headphones from damage due to high power. It has its own charging cable included in the kit which is ideal for charging. The remaining battery percentage is present on your phone screen. These headphones come with 45 days of money back guarantee and 18 months of warranty in case of any technical problems. The headphones fit perfectly in the human ear. It uses IPX7 coating which makes it durable and sturdy. The sound quality provided is very authentic and has its highs and lows. It comes with 45 days money back guarantee and 18 months warranty. It has slight connection problems from time to time. These headphones are ideal for audiophiles who are looking for good quality sound at a reasonable price. 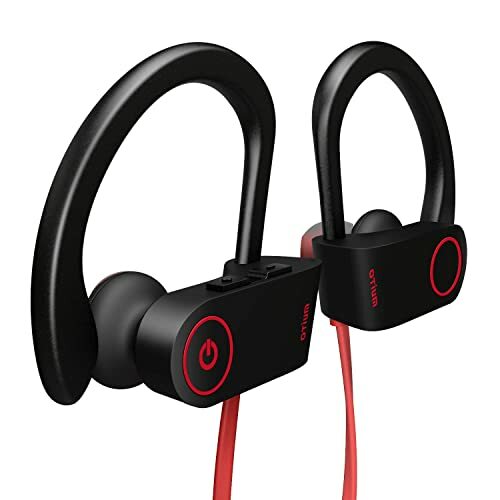 With high-definition stereo sound and long battery life, this pair of wireless headphones features IPX7 coating that makes it sweat and waterproof. This coating also positively affects the durability and sturdiness of the headphones and also its performance over time. They are all rounders when it comes to its use. they can be used while working out as well as they are ideal for use while riding a bicycle or a bike. You can easily store it in its storage pack and you don’t have to worry about detangling the headphones every time you take them out of the storage. With a clear and crisp sound and clear highs and lows, the stereo sound and amazing bass that these headphones provide with Bluetooth 4.1 EDR technology are commendable. These headphones are a complete package when it comes to good battery time, high-quality sound and a good ear fit. With 30 feet of Bluetooth range, you can connect these headphones to two devices simultaneously. Moreover, it has buttons on it that let you play, pause and skips sounds. Also, these buttons help you in picking and dropping calls. The receiving and sending quality of the sound is also up to the mark. It comes with 30 days of no questions asked money back guarantee and 1 year of warranty in case of any technical fault. It has a long range of at least 30 feet with no obstacles in between and 10 feet in case of obstacles. Includes 30 days money back guaranty and 1-year warranty. The device provides crisp HD sound with the EDR technology. They cannot be used while they are charging. How to Choose the Best Bluetooth Earbuds? This is the first thing you need to keep in mind while buying yourself a pair of wireless headphones because once you go to the market, you will find a hundred different type of headphones in prices ranging from $10 to $500. Hence, if you have your budget in mind your choices will be narrowed down automatically. Definitely, the $500 earbuds will have something special but usually, the mid-range wireless headphones also feature good technologies. You just need to keep your facts straight and know what you want. The second question you need to ask before going wireless headphone shopping is “where and how will you be using it?”. This will help you understand what kind of technology you are looking for. Whether you want waterproof ones or just simple ones will do. For example, if you spend a lot of time outdoors and require these headphones for using outdoors you might want to find something with noise cancellation so that when you take or receive calls, the sound quality is not bad. Similarly, if you want something for a workout, it is better you look for the ones that have a special grip in the earpiece. Battery time is one of the biggest concerns when dealing with anything that is wireless. Since Bluetooth headphones are small and compact, the battery life is usually not very high. However, you can get some headphones that can go on for as long as 14 hours straight. Thus, you need to analyze how long you will be using the headphones. Also, the type of operation you need to carry out is important. listening to songs non-stop takes more battery as compared to phone calls. Sound quality test is something that helps you determine how non-flat the music in you’re the headphones is. To perform a sound quality test, you need to wear the headphones and choose a song with frequency changes and a number of highs and lows so that you can evaluate the performance of the headphones. The sound quality test requires testing the frequency response, dynamic range along with a number of other features. However, without the proper audio files, you cannot test your Bluetooth earbud’s sound quality. For proper audios and stepwise testing refer to this page. The wireless headphones are an example of the technological innovation we have reached but thinking about how well they serve us, I would say they are a must have for everyone. In this article, we have mentioned 7 best Bluetooth earbuds for different uses. These headphones are not only less fussy but are also easy to connect and handle. You don’t have to keep your phone on you always, your hand or your pocket. 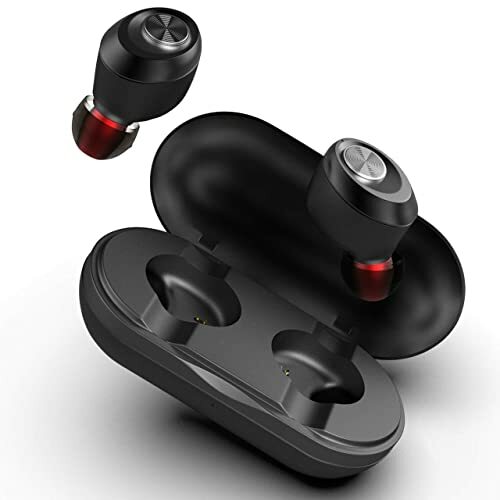 However, while looking for the perfect pair of wireless earbuds, you need to keep your eyes open as there are many options on the market that will leave you confused.